Murder in Palm Beach: The Homicide That Never Died is based closely on a real murder that happened in 1976. Rodger Kriger, a prominent resident of the posh town, is fatally shot one night through a window of the six-member family’s home. A politically ambitious prosecutor gets a hoodlum/karate expert named Mitt Hecher convicted on the basis of testimony by jail mates, and he is sent to the brutal and anarchic state prison at Raiford prison. While attorneys appeal for a new trial, Hecher’s wife contracts a usually fatal disease, and he is devastated. Did Hecher kill Kriger? A newspaper reporter who questions Hecher’s guilt continues to investigate the murder for years, and digs up shocking new information. A number of scenarios cast suspicion on other possible perpetrators. Did the sons of a wealthy Cuban do it? Were the operators of a gambling enterprise out to get Kriger? Was a prominent politician behind the slaying? Did a vicious underworld figure do the bidding of a criminal gang? Was a love triangle the basis for the shooting? 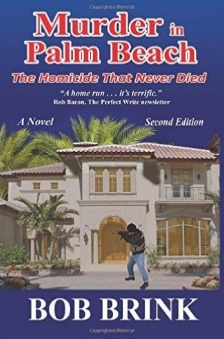 Murder in Palm Beach is the tale of a man whose deeds have sent him plummeting to the bottom, and powerful forces determined to keep him there. A murder mystery with all the ingredients to keep the reader riveted, it is primarily a powerful story of redemption. So this isn't usually a book I would go for and while I found it interesting at times I also found it boring. It felt like I was watching an episode of forensic files with my dad. I felt bad fo Mitt that he had such a bad attorney. I was definitely frustrated with everything that was happening to him. It was hard not to root for the poor guy. It's cool that this was based on a real murder and I thought that would entice me more but it didn't. Sorry but this was just not a book for me.